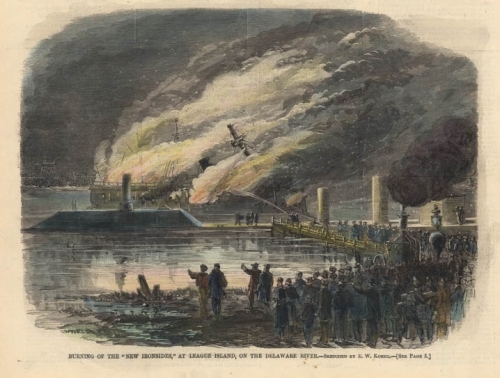 BURNING OF THE "NEW IRONSIDES," AT LEAGUE ISLAND, ON THE DELAWARE RIVER. Image size 6 3/4 x 9 1/16" (17.1 x 23.2 cm). Publisher : Published by Harper's Weekly, January 1867. The USS New Ironsides was commissioned in 1862 by Federal forces to be used against the Confederacy during the American Civil War. She was largely used to blockage Confederate ports, such as Charleston, South Carolina. Her hearty shell made her difficult to damage, and her powerful guns a force to be reckoned with. Even a torpedo proved incapable of causing any real damage to her hull in 1863. In his address to the Georgia Historical Society in 1879, Charles H. Olmstead said of New Ironsides, "Her broadsides were not fired in volley, but gun after gun, in rapid succession, the effect upon those who were at the wrong end of the guns being exceedingly demoralizing. Whenever she commenced there was a painful uncertainty as to what might happen before she got through." The ship was outfitted with fourteen 11-inch Dahlgren smoothbore guns and two 150-pound Parrot rifled guns.